You are the SharePoint Online administrator for Contoso, Ltd. The company purchases an Office 365 Enterprise El plan. The public-facing website must use SharePoint Online and the custom domain contoso.com. You need to configure the DNS settings for the public-facing SharePoint site. How should you configure the DNS settings? Select the appropriate options from each list in the answer area. A company deploys an Office 365 tenant. All employees use Lync Online. You need to configure the network firewall to support Lync Online. Which ports must you open? To answer, drag the appropriate port number to the correct feature or features. Each port number may be used once, more than once, or not at all. You may need to drag the split bar between panes or scroll to view content. You are the Office 365 administrator for your company. You need to ensure that trusted applications can decrypt rights-protected content. Which four Windows PowerShell cmdlets should you run in sequence? To answer, move the appropriate cmdlets from the list of cmdlets to the answer area and arrange them in the correct order. You are the Office 365 administrator for Contoso, Ltd. User1 is unable to sign in. You need to change the password for User1 and ensure that the user is prompted to reset her password the next time she signs in. How should you complete the relevant Windows PowerShell command? To answer, drag the appropriate Windows PowerShell segments to the correct location or locations. Each Windows PowerShell segment may be used once, more than once, or not at all. You may need to drag the split bar between panes or scroll to view content. You are the Office 365 administrator for your company. A user named User1 from a partner organization is permitted to sign in and use the Office 365 services. User1 reports that the password expires in ten days. You must set the password to never expire. Changes must NOT impact any other accounts. You need to update the password policy for the user. Which Windows PowerShell cmdlet should you run? You are the Office 365 administrator for your company. Users report that their passwords expire too frequently, and they do not receive adequate notice of password expiration. Account passwords must remain active for the longest duration allowed. Users must receive password expiration notifications as early as possible. You need to configure the password expiration policy. How should you set the policy on the password page of the Office 365 admin center? To answer, drag the appropriate duration to the correct location. Each duration may be used once, more than once, or not at all. You may need to drag the split bar between panes or scroll to view content. A company has 50 employees that use Office 365. You need to disable password expiration for all accounts. How should you complete the relevant Windows PowerShell commands? To answer, drag the appropriate Windows PowerShell segment to the correct location in the answer area. Each Windows PowerShell segment may be used once, more than once, or not at all. You may need to drag the split bar between panes or scroll to view content. A company deploys an Office 365 tenant. All employees in the human resources (HR) department must use multi-factor authentication. They must use only the Microsoft Outlook client to access their email messages. User1 joins the HR department. You need to help User1 configure his account. Which three actions should you perform in sequence? To answer, move the appropriate actions from the list of actions to the answer area and arrange them in the correct order. You are the administrator for a company named Contoso, Ltd. The company has an Office 365 subscription. Your need to prevent users from changing their user display name by using Outlook Web App. What should you do? You are the Office 365 administrator for your company. The company uses Active Directory Federation Services (AD FS) to provide single sign-on to cloud-based services. You enable multi- factor authentication. Users must NOT be required to use multi-factor authentication when they sign in from the company’s main office location. However, users must be required to verify their identity with a password and token when they access resources from remote locations. You need to configure the environment. What should you do? 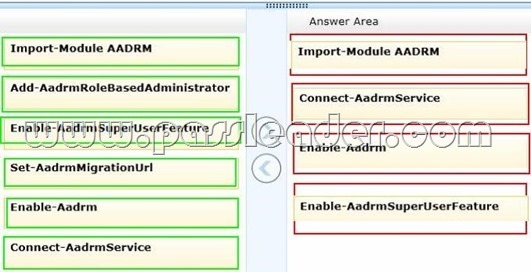 An organization has over 10,000 users and uses a SQL-based Active Directory Federation Services (AD FS) server farm. You need to change the AD FS 2.0 service account password. What should you do? Select the correct answer from each list in the answer area. A company deploys an Office 365 tenant. 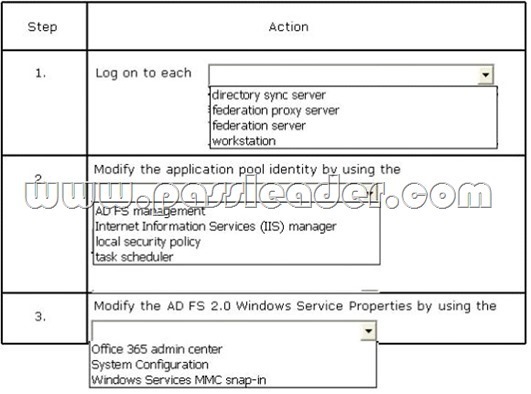 You install the Active Directory Federation Services (AD FS) server role on a server that runs Windows Server 2012. 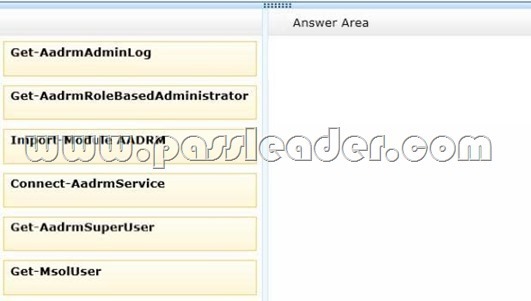 You install and configure the Federation Service Proxy role service. Users sign in by using the Security Assertion Markup Language (SAML) protocol. You need to customize the sign-in pages for Office 365. Which pages should you customize? To answer, drag the appropriate page to the correct customization. Each page may be used once, more than once, or not at all. You may need to drag the split bar between panes or scroll to view content. A company plans to deploy an Office 365 tenant. 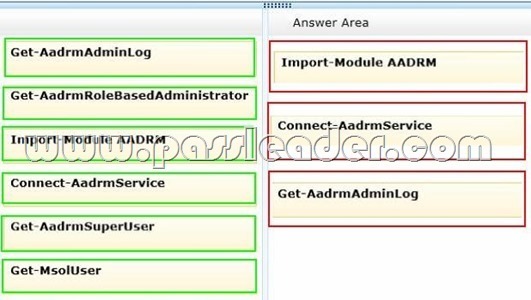 You have two servers named FS1 and FS2 that have the Federation Service Proxy role service installed. 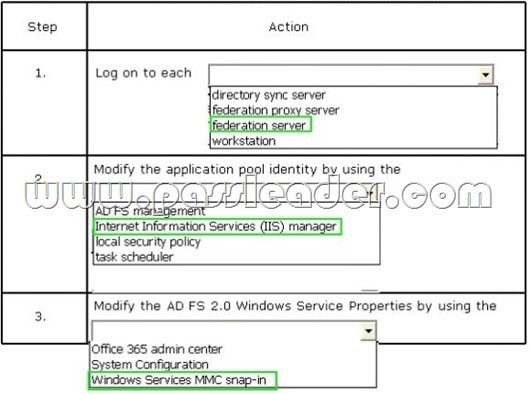 You must deploy Active Directory Federation Services (AD FS) on Windows Server 2012. You need to configure name resolution for FS1 and FS2. What should you do? A. On FS1 and FS2, add the cluster DNS name and IP address of the federation server farm to the hosts file. C. On FS1 only, add the cluster NetBIOS name and IP address of the federation server farm to the LMHOSTS file. D. On FS1 and FS2, add the cluster NetBIOS name and IP address of the federation server farm to the LMHOSTS file. You are the Office 365 administrator for your company. You must configure a trust between the on-premises Active Directory domain and the Office 365 environment by using Active Directory Federation Services. You need to assign the correct certificate to the description of your on-premises server environment below. Which certificate types should you assign? To answer, drag the appropriate certificate type to the correct test description. Each certificate type may be used once, more than once, or not at all. You may need to drag the split bar between panes or scroll to view content. You must obtain a certificate from a certification authority and install it on the federation servers. You need to specify the subject name for the certificate. Which name should you specify?